France and my family home have never felt so far away than this week. Like thousands of other people, my travel plans were severely hindered this past weekend - and unfortunately still are. 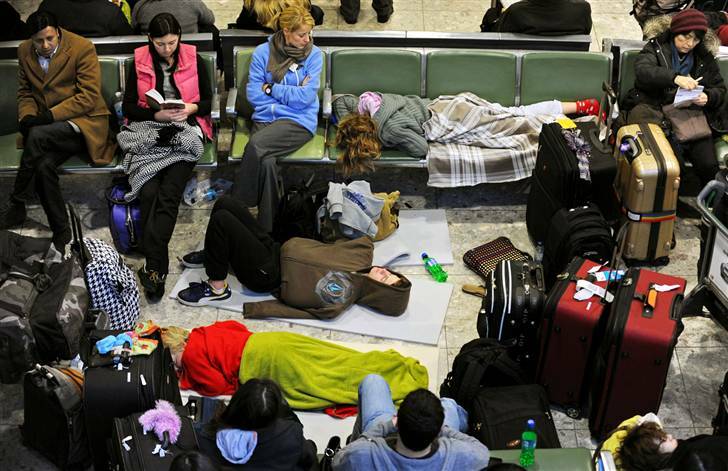 Unusually heavy snow flurries hit most parts of Britain and closed down airports. I always fly via London and therefore my flight on Saturday night was canceled but I managed to rebook for the following night on a 1am red-eye. I made it to London by Monday lunch time, expecting to grab my connecting flight to Lyon that evening. Except that it was canceled too and no-one could tell us when we could expect to fly to our final destination. In fact now, 3 days later, British Airways still has no information about alternative flights on their site and their phone lines are dead. I luckily have a lot of friends in London and therefore have spent the last few days warmly ensconced with one of them, but thousands were left stranded in the airports for days with nowhere to go. On Tuesday, I spent hours on the Internet and on the phone trying to find a way, any way, to get to my parents in time for Christmas. The Eurostar was fully booked and barely functioning. I even considered taking a 2 day journey consisting of taking 3 trains and a ferry to get there but even availability for that was scarce. At the height of my despair, I called my parents and burst into tears of frustration and sadness that I may not make it at all. I know I am a grown woman but I have never spent a single Christmas without my family and the prospect of that happening left me devastated. I guess these kind of things make you realize what's important and when I miraculously found an Easyjet flight leaving Gatwick at 7am on Dec 24th, I booked it straight away, ignoring the cost. So now, unless the snow situation gets much worse, I should be able to at least spend 3 days with my family before returning to London to spend New Year's Eve with friends as was originally planned. I can't wait.